Gaspard Philibert, Napoleon’s Indian interpreter in Napoleon in America, appears in the historical record thanks to Dr. John Sibley, a Massachusetts-born physician who moved to Louisiana in 1802, the year before Napoleon sold the territory to the United States. Sibley settled in Natchitoches, where he worked initially as a surgeon on contract with the Department of War to care for the new US troops stationed in the area. In 1805, Sibley was commissioned as the Indian Agent for Orleans Territory and the region south of the Arkansas River. Sibley’s job was to keep an eye on the Indian tribes between the Red River and the Sabine River, and as far west as Matagorda Bay. 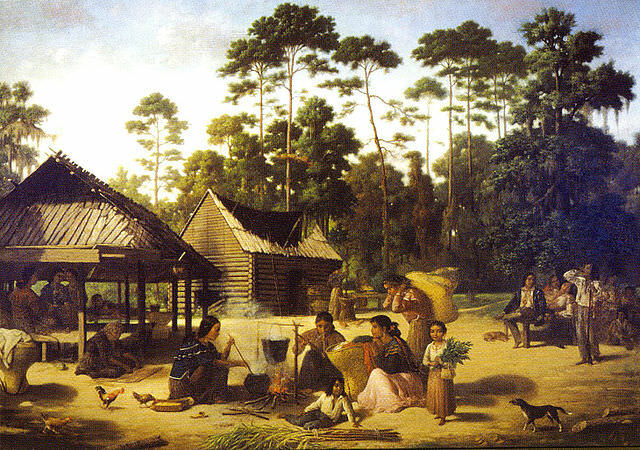 His aim was to keep the Indians at peace both among themselves and with the white settlers in Louisiana. He also wanted to keep the Indians friendly towards the United States, in case they were needed as allies in a war against Spain or Britain. One of the means of doing this was to divert the Indian trade from the Spaniards, who were then in possession of Mexico (which included Texas), to the United States. At Sibley’s recommendation, an Indian factory was set up at Natchitoches to compete with the Spanish factory at Nacogdoches. The “factories” were trading posts, where Indians could exchange furs for manufactured goods, such as clothing, weapons and agricultural equipment. Sibley was also given $3,000 worth of goods each year to offer as presents to the Indians. He was instructed to protect the Indians in their trade, to prevent the sale of whisky to them, to keep the Indians in their villages, to prevent the whites from intruding on Indian land, and to promote agriculture among the Indians. 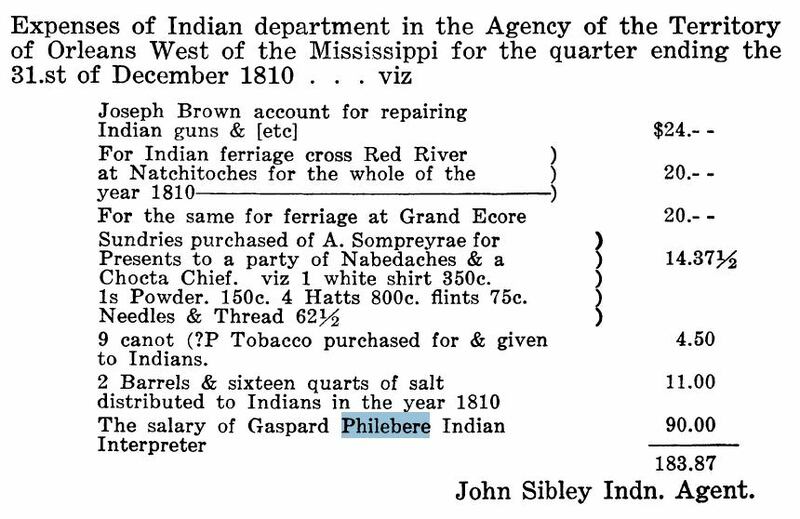 Expenses of John Sibley’s Indian department for the last quarter of 1810, showing Gaspard Philibert’s salary. Source: Julia Kathryn Garret, “Dr. John Sibley and the Louisiana-Texas Frontier, 1803-1814 (Continued),” The Southwestern Historical Quarterly, Vol. 48, No. 1 (July 1944), p. 71. In an 1822 audit provided by Secretary of War John C. Calhoun to the House of Representatives, “Gasper Philibert” is listed as being an interpreter with the Red River agency, with an annual compensation of $420. (6) I don’t know what happened to Gaspard Philibert after that. Joyce Purser, “The administration of Indian Affairs in Louisiana, 1803-1820,” Louisiana History, Vol. 5, No. 4 (1964), p. 415. Elizabeth Shown Mills, Natchitoches, 1729-1803: Abstracts of the Catholic Church Registers of the French and Spanish Post of St. Jean Baptiste Des Natchitoches in Louisiana (New Orleans, 1977), pp. 142, 173. Julia Kathryn Garret, “Dr. John Sibley and the Louisiana-Texas Frontier, 1803-1814 (Continued),” The Southwestern Historical Quarterly, Vol. 47, No. 3 (Jan. 1944), pp. 321-322. Julia Kathryn Garret, “Dr. John Sibley and the Louisiana-Texas Frontier, 1803-1814 (Continued),” The Southwestern Historical Quarterly, Vol. 49, No. 4 (Apr. 1946), p. 610. “The administration of Indian Affairs in Louisiana, 1803-1820,” p. 415. American State Papers: Documents, Legislative and Executive of the Congress of the United States: Indian Affairs, Vol. II (Washington, 1834), p. 365. The practice of relying on multiple layers interpreters with the Indians can explain some misunderstandings. I read that during the Lewis and Clark expedition the Americans would speak English to Toussaint Charbonneau who would translate into French for his wife, Sacagawea, who would then translate into the Indian languages. The process would be reversed to get the response back to the Americans. It is understandable that the Indians did not grasp the Anglo-American concepts of land ownership and other things. Thanks, Jim. I didn’t know that about the Lewis and Clark expedition. It reminds me of the “telephone” game, in which something whispered at one end can come out quite garbled at the other. As you say, it’s no wonder there were misunderstandings. He is a faithful, honest, sober, attentive man, & can interpret for any Indians who visit us & there are within the limits of my agency more than twenty different tribes of Indians, most of whom speak languages peculiar to each tribe.